Hosting Marketers Review 2019: Is Hosting Marketers a Good Hosting? Hosting Marketers provides a versatile video streaming hosting service along with SEO services and web design solutions. Hosting Marketers is a privately owned U.S. company which since 1999 has been providing web hosting services, dedicated servers, domain registration, design, and development services. This company sells several plans at decent prices from its English-language website. This company doesn’t offer the usual hosting packages. It’s primarily focused on providing video streaming hosting services such as Red5 hosting, RTMP hosting, and FFmpeg/Red5 reseller hosting. Hosting Marketers also offers FFmpeg/Red5 reseller hosting packages with high resource allocations. These allow you to promote brands and engage with website visitors through video streaming. If you want to deliver outstanding media streaming services such as live broadcast for big events without having to build your streaming server from scratch, then the Wowza live streaming accounts will provide you with up to 999 simultaneous viewers, an ad-free player, and 2 TB to unlimited traffic. You can stream on any RTMP encoder and to all endpoints as well as Apple devices. You also get an on-demand video streaming that allows you to do live streaming, on-demand video streaming, create a TV station, or do a live camera restream from an IP camera. Hosting Marketers has a data center on the East Coast of the U.S. that houses Dual Xeon Quad Core E5-2629 servers with 64 GB RAM that are secured by RAID systems and have server backups to maintain a 99.9% network uptime SLA. Although this company doesn’t let you house your own servers in its data center, it does offer competitive dedicated server packages with unrestricted data transfer. And if you need more streaming capacity, the enterprise-level hybrid servers give you the full power and features of a dedicated server at a lower cost. These hybrid servers come with daily and weekly backups and 99.97% guaranteed uptime. Hosting Marketers’ plans come at reasonable prices with no additional usage fees. You can take advantage of a three-day free demo of the Wowza Live Streaming plans, and you get a 30-day money-back guarantee with all plans. Subscriptions can be made using a major credit card or PayPal. Hosting Marketers offers versatile video streaming hosting plans plus other services such as SEO consultancy and web design. Sadly, the customer support is very limited and hard to reach. 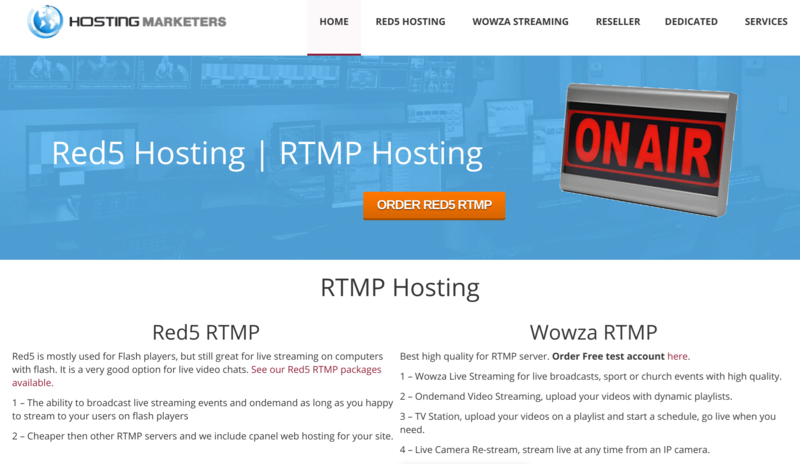 For video streaming hosting, head over to Hosting Marketers ! Wondering how Hosting Marketers stacks up against other Web Hosting companies? Enter any other Web Hosting company and we will give you a side-by-side comparison.